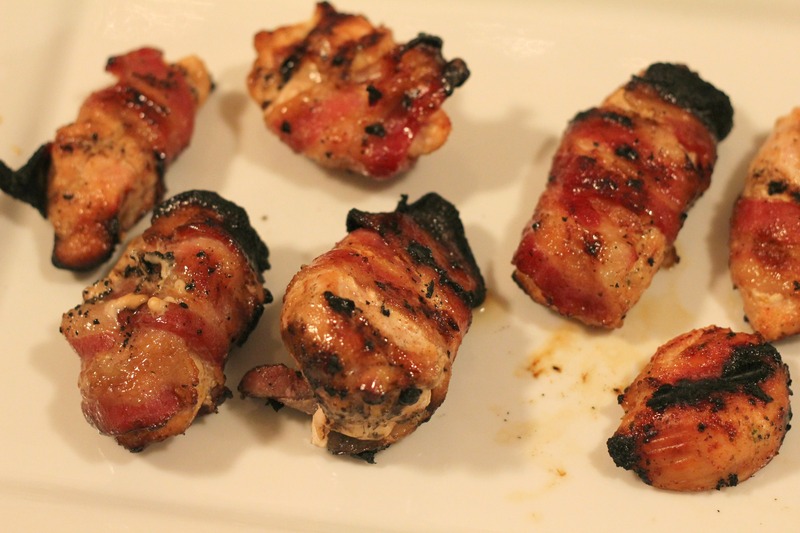 In a previous post on Bacon Wrapped Grilled Chicken, I talked about how grilled bacon is the BEST of all the ways to prepare bacon (and it’s the truth). This recipe takes that same idea and takes it to the next level. My favorite part of this dish (in addition to the bacon), is the brown sugar. Once it’s grilled, it just turns into this sweet glaze that is just SO GOOD. This is also a versatile recipe. You could cut the chicken breasts into smaller chunks before wrapping it in bacon and serve it as an appetizer, or you could cut them into tenders and make a meal out of it. We did the latter, and it was definitely filling! Although, the next time we have a football party, we might make them as appetizers because these would be perfect for watching some football! We really loved this recipe, plus it’s super easy to make! It uses ingredients that you mostly have on hand–all I had to buy was the bacon. This can be grilled or baked. Mine didn’t turn out spicy at all (which is fine with me because I’m not wild about spicy). So if you want yours to have more of a kick to balance out the sweetness, then you’ll want to add more chili pepper. Cut each breast into 3 pieces. Season the chicken with all the spices to your liking. Wrap a bacon slice around each piece and then roll in brown sugar until coated. For the Oven: Place chicken in a sprayed baking dish and bake at 400 degrees for 30 to 40 minutes or until chicken is cooked through and bacon is nice and brown and crispy. For the Grill: Grill on high heat for about 2 minutes on each side. Then cook for another 6-8 minutes per side on low heat. Bacon and brown sugar. Obscene! Isn’t it? I saw this recipe, and just from glancing at the handful of ingredients knew it would be stellar (and it was) Bacon and brown sugar are always a win-win combination. YUM! I think I’ll make this tonight! Sounds amazing! Just season the chicken to your liking, wrap a piece of bacon around it and set it on the grill! Cook it like you would normally grill chicken. You might need a toothpick to keep the bacon on the chicken though.